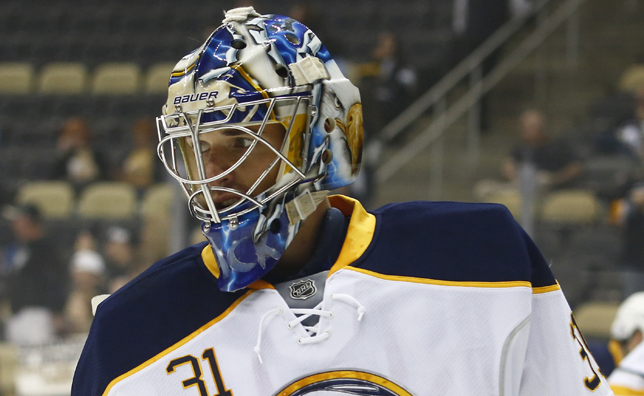 Matt Hackett was very much seen as a serious candidate as the goalie of the future for the Sabres when he was acquired at the 2013 trade deadline. He’s since slid down the depth chart and sits in a precarious position as the 2014-15 season dwindles away. Entering the year, Hackett needed to get in eight appearances of at least 30 minutes to remain a restricted free agent heading into the offseason. His status is a unique one that isn’t encountered too often, but put both himself and Tim Murray in an odd situation even before the season started. Hackett’s up-and-down play, late-season knee injury, the emergence of Nathan Lieuwen and the presence of both Jhonas Enroth and Michal Neuvirth made things that much cloudier. Of course, things have cleared up a bit as Enroth and Neuvirth were both traded and Chad Johnson was injured before appearing in a game, leaving just Hackett and Anders Lindback to man the crease for the remainder of the year. Lindback’s hot play has kept Hackett from seeing the lion’s share of the work and time is running out with only nine games to go in the season. The curious predicament is two-fold. First, Lindback has played strong enough to keep the crease as Ted Nolan doesn’t appear to have any interest in helping Tim Murray with asset management. Second, Hackett’s lack of playing time and success in the Buffalo system may not make it absolutely necessary that he reach that ever important 26 official appearance threshold. Anders Lindback has been strong since making his Sabres debut and despite their incredibly early elimination from the playoffs, Nolan continues to ride the hot hand. This is maddening for tank enthusiasts as Lindback has stolen a few points already. However, it’s more frustrating for me as I watch Nolan contribute to the mismanagement of a prospect. Now, Hackett hasn’t lit the world on fire since he got to Buffalo. He had all but lost the Rochester net last season before getting injured. He began to heat upon his return and that helped contribute to his recall after Johnson’s injury. His lack of consistent success has made him something of an afterthought and it isn’t a stretch to think that Murray could just as easily sign him as an unrestricted free agent as he could by tendering him since it’s safe to assume there won’t be much of a market for Hackett this summer. However, as he’s healed up, he’s begun to show why he had become such a widely regarded prospect. He’s moves very well and plays an athletic style. As Brian Duff pointed out on Saturday, Hackett doesn’t wear bulky equipment and relies largely on his skill and athleticism to play the position. I not only appreciate a player who plays that way, but I also prefer to see the Sabres acquire and develop goaltenders who adopt that style. When it comes down to it, I’d take a mobile, athletic goaltender to a guy who sits on the goal line and gets hit with pucks. What really rubs me the wrong way about all of this is that Hackett is an asset. He may not be a blue chip anymore, but he’s still an organizational asset who hasn’t proven to be without worth moving forward. He looked to be turning a corner – to an extent – with the Amerks and even turned in a terrific start this weekend in Nashville. His resume is still limited, though. I don’t think it’s a stretch to say that getting one more extended look at him would be the best course of action. That would require him to actually see time down the stretch, something his coach doesn’t seem open to just yet. The bottom line here is that losing an asset, no matter how valuable or invaluable, is bad business. And Ted Nolan is contributing directly to that. A big part of what is so irritating is that there is literally nothing to gain by riding Lindback. It should be easy enough, let Lindback and Hackett split time down the stretch and ensure that your potential RFA doesn’t suddenly revert to a UFA. Buffalo has been mathematically eliminated from the playoffs for weeks while their true elimination date likely goes back to the end of the 2014 calendar. Before catching his hot streak here, Lindback had all but played himself out of the league. Even his hot run doesn’t lead me to believe that he’s suddenly worth an NHL contract, either. In fact, with Chad Johnson already under contract and the possibility of Murray trading for a starter this summer, I doubt that Lindback winds up as part of the plans either way. But Nolan keeps trotting him out to the disdain of tank enthusiasts and people like myself who would prefer to not see Hackett leave for free. I should add that this isn’t tank related either, it’s simply related to handling and developing prospects. The team cannot make the playoffs and this stretch run is a perfect time to offer up vital auditions for players who may be question marks at this time. Hackett and Mikhail Grigorenko are perfect examples of this. Nolan certainly isn’t doing irreparable harm to the club by not playing Hackett, but he’s also showing a fair bit of ignorance by not getting the young goalie the games he needs. It’s hard to see Hackett as part of the future now, but if Murray can tender him and a full, healthy year yields strong results, he may vault back up the depth chart as a result. But if Nolan keeps playing his pending UFA goalie, Murray’s job will be that much harder. This probably ties into Nolan’s desire to go out with pride. It’s hard to see Murray keeping Nolan around next year. Sure, he’s gotten a really raw deal here, but the Sabres haven’t shown any semblance of a system at any end of the rink this season and you can only compete so hard when you’re the most out-shot and out-possessed team in league history. Of course, this isn’t the first time Nolan has shown piles of pride despite the wishes of his general manager. Nolan famously walked away from Darcy Regier’s contract offer the first time around in Buffalo and the split off Long Island in the midst of a massive management shake up in the mid-2000s. Now, he’s likely on the way out again after helming a bad roster to an even worse finish for a season and a half. It’s still no excuse for hamstringing the development of a kid like Hackett. It’s hard to argue that the Sabres need Hackett to get those eight appearances in, but I don’t think it’s hard to argue that it’s easily the best approach for both the short and long term for the franchise. Hopefully the lauded “players coach” who has previously been lauded for his ability to develop players will realize that and get Hackett back in the crease five more times.